Lebanese society has had a remarkable ability to overcome deep-rooted sectarian and religious divides that could readily have imploded less problematic countries. This has been largely due to its pragmatic political system, which avoids acting upon polarizing issues on principle, opting instead for pragmatic loopholes. Given their confessional political system, Lebanese are conditioned to think pragmatically even when the issue at hand is divisive and does not lend itself to resolution. In Lebanon, pragmatism is a necessity and not an option as failure to accommodate other sects might ruin the country's delicate fabric. Three vivid illustrations of this dynamic can be seen in the handling of the issues preoccupying Lebanese decision-makers these days: Hezbollah's continued militarization, the Special Tribunal for Lebanon (STL), and the Syrian connection. Demands to disarm Hezbollah have grown since its 2006 war with Israel from Sunni as well as from some Shiite politicians only to be countered by other leaders in the patchwork politics that is Lebanon. 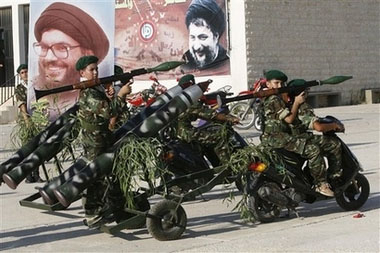 Most non-Shiite Lebanese find it difficult to accept Hezbollah's armament and have not missed an opportunity to express displeasure with the fact that, while the 1989 Ta'if agreement called for the demilitarization of all Lebanese militias, Hezbollah was exempted on the grounds that it was resisting Israel's presence in southern Lebanon. As much as they disapprove of Hezbollah's behavior, Lebanese find it politically correct to praise its "resistance." The proverb "kiss the hand you cannot bite" seems to fit the way many Lebanese view the militant Islamist group. Against this backdrop, it is hardly surprising that Hezbollah's military buildup and its rivals' intensifying demand for its disarmament have been the most divisive issue since Israel's withdrawal from its security zone in south Lebanon in May 2000. This demand for disarmament gained considerable momentum after the July 2006 Israel-Hezbollah war as the eviction of Hezbollah from its bases south of the Litani River and the deployment of the Lebanese army in its place led critics to question the need for the group's continued militarization. Thus, for example, the pro-Hariri member of parliament (MP) Ahmad Fatfat argued that Hezbollah's primary concern had shifted from confronting Israel to controlling Lebanon "and transforming it into a forward base on the Mediterranean for Iran." His parliamentary peer Sami Jemayyil compared "Hezbollah's expansionist behavior in Lebanon" to that of the Zionists, while former Lebanese president Amin Jemayyil noted that "Hezbollah seems preoccupied these days with controlling the site of the Lebanese government in Beirut and the Special Tribunal's location in [the] Hague." Addressing his supporters on the sixth anniversary of the March 14 coalition, former prime minister Saad Hariri criticized "the supremacy of [Hezbollah's] arms and the manner in which it is influencing the formation of the country's forthcoming cabinet [of Najib Miqati]." Even Nabih Berri, speaker of parliament and leader of the Shiite Amal movement—who showered Hezbollah with praise and defended its right to resist "the Israeli occupation" as "nonnegotiable"—was paraphrased by a released Wikileaks cable as having privately said that "he supported Israeli military action against Hezbollah in 2006 as long as it did not backfire and create more public support for the party." It makes eminent sense for Berri to wish the demise of Hezbollah, whose rise to prominence among Lebanese Shiites came at Amal's expense. This does not seem to be the case with Druze leader Walid Jumblatt, who has perfected the shadowy art of doublespeak, rejecting Hezbollah's use of arms for domestic purposes while refusing "to expose Lebanon to Israeli aggression." Jumblatt won notoriety for continuously vacillating from one political camp to another. His ambivalent statement above suggests that he does not preclude the possibility of returning to the March 14 coalition should Hezbollah's fortunes wane. But most surprising and perplexing was the change of heart of Bishara Boutros Rai since his appointment as Maronite patriarch in March 2011. In his previous capacity as archbishop of Byblos, he voiced deep concern over Hezbollah's arsenal. Once appointed to the top religious post, however, he expressed understanding of the group's reluctance to disarm: "The international community has not pressured Israel to pull out of Lebanese territory. Hezbollah also wants to help armed Palestinians in Lebanon who want to be granted the right of return to their lands. … When this happens, we will tell Hezbollah to disarm." Ibrahim Amin Said, head of Hezbollah's politburo, concurred: "The issue has nothing to do with the manner in which the resistance uses its arms as some would like to argue; the issue pertains to the justification of the very existence of the resistance, and whether Lebanon should have a defense force capable of deterring the Israeli enemy." The issue of the U.N. Special Tribunal is even more divisive than Hezbollah's militarization. While Hezbollah takes pride in its weapons, presented as a deterrent to Israel, its implication in the 2005 assassination of former prime minister Rafiq Hariri brings shame to the organization. It seems that Hezbollah is more concerned about the moral blow to its image and prestige attending an association with the assassination than the arrest of its indicted members and their surrender to the U.N. Special Tribunal. The tribunal for its part scaled down the scope of its investigation, choosing to indict individuals in Hezbollah rather than the organization itself. Accommodation and pragmatism have been extended even to the pursuit of justice where a delicate balance was struck between law enforcement and public peace. At least in their public pronouncements, Hezbollah spokesmen were still dissatisfied with the tribunal, even in its reduced scope. In a press conference held by Muhammad Raad, head of Hezbollah's parliamentary bloc, he described the tribunal as a "creation that serves international interests at the expense of the will and interests of the Lebanese people and their constitutional institutions" and called upon "all free, honorable, and nationalist Lebanese, regardless of their affiliations and positions, to boycott the tribunal's requests." Nabil Qawuq, deputy chair of Hezbollah's Executive Council, derided the indictment of Hezbollah personnel as "an effort by the U.S. to compensate for its political defeats in Lebanon and the rest of the region." Hashim Safieddine, chair of the council, ridiculed the Special Tribunal as "a political and media farce totally divorced from the pursuit of justice." Despite the overwhelming evidence implicating Hezbollah in the assassination, Secretary General Hassan Nasrallah and his allies have never ceased to plead the group's innocence. As soon as the tribunal indicted four Hezbollah members in the assassination, Nasrallah described them as honorable men who resisted Israel's occupation and, instead, laid the blame on the Jewish state, which had allegedly plotted the indictments. When the tribunal revealed the names of these operatives shortly afterward and requested the Lebanese government to turn them in within thirty days to stand trial, Nasrallah responded disdainfully: "They cannot find them or arrest them in thirty days, or sixty days, or in a year, two years, thirty years, or three hundred years." Nasrallah advised the leaders of the March 14 opposition not to expect the government of Prime Minister Najib Miqati to do in connection with the tribunal "what the government of his predecessor Saad Hariri couldn't do." For his part, Miqati emphasized Beirut's commitment to fulfill its international commitments, which included "paying its share of $32 million toward the cost of the STL operations," yet refused to "talk about solutions now, because I want the government efforts to succeed." He also disregarded U.N. Secretary General Ban Ki-moon's concern about the Lebanese government's reaction to the deepening crisis in Syria, noting that he would not "endanger Lebanon by violating the rules of the international legitimacy." This did not escape Hezbollah's eye. Though repeatedly voicing his disapproval of financing the tribunal, Nasrallah and his colleagues were sympathetic to Miqati's predicament, claiming that the prime minister "must not be embarrassed by the reaction of the international community and his own constituency if he reneges on Lebanon's commitments." They understand all too well that there is nothing they can do to stop the working of the tribunal. They can resent it and plead their innocence with their Shiite constituents—the main target audience of Hezbollah's rhetoric. As far as Hezbollah's leadership is concerned, what matters is how the Shiite community perceives them; the tribunal's activities are of far lesser concern as they seem to believe that its eventual impact will be minimal. Lebanon's government finds itself in an unenviable position of having to accommodate Syrian interests and sensitivities, on the one hand, and the positions of its own divided communities vis-à-vis Syria, on the other. Ever since Lebanese independence, Damascus has been a constant political actor in its neighbor's affairs, forcing successive Lebanese governments to play a delicate game of appeasing everyone. Thus, for example the Lebanese government has recently stated that it cannot support a U.N. Security Council resolution on Syria, but it will abide by international resolutions, irrespective of what it thought of them. For their part, the Syrians have never reconciled themselves to Lebanon's creation on what they perceive as part of their territory. They also resented Beirut's development during the French Mandate from a slumbering provincial city into a business, medical, and educational hub, and it did not take long for relations to sour after the French departed in 1946. In 1950, the Syrian regime unilaterally dissolved the bilateral customs union and instigated the practice of closing down passenger and trade routes at will. Since then, bilateral relations have been characterized by envy, suspicion, resentment, and hate. It took the entry of the Syrian army into Lebanon in 1976 to finally give the Damascus regime a sense of vindication. Damascus's hegemony in Lebanon lasted until 2005 when the Syrian army pulled out shortly after Hariri's assassination. Given their intense involvement in Lebanese affairs, the Syrians could always count on Lebanese allies. Certainly, any government in Beirut, irrespective of its relations with Damascus, understands the inherent mindset of the regime, which views the Lebanese as unappreciative of the selfless sacrifices of the Syrians on their behalf. Because Syrian officials seem to believe that retribution follows ingratitude, their Lebanese counterparts have been especially careful to avoid incurring their wrath. This has been particularly the case since the beginning of the Syrian uprising in mid-March 2011. The simultaneous inception of the Syrian protests with the decision of the March 14 coalition to boycott the Miqati cabinet gave ammunition to Damascus's official claim that "the security of the two countries is inseparable." The Bashar al-Assad regime immediately accused the Future Trend party of providing material support for anti-regime elements. The secretariat general of the March 14 coalition responded by issuing a denouncement of the Baath regime's "baseless accusations of intervention in Syrian affairs, including support for saboteur networks." There is no denying that many Lebanese, especially Sunni Muslims, have expressed jubilation about the Syrian uprising, criticizing the Miqati government's decision to refrain from providing relief for the thousands of refugees fleeing Syrian army reprisals. Tripoli MP Muhammad Kabbara urged the Lebanese people to take the side of the Syrian people: "I hurt because the brotherly Syrian people are subjected to a systematic massacre, and I am ashamed because we are letting them down. We are under history's watchful eye. We must take political, moral, and humanitarian action to lend support to the Syrian people." As in most protest organizing in Arab countries, the mosques played a key role in galvanizing Lebanese support for the anti-Assad movement. One hundred Sunni clerics convened in a Tripoli mosque to "express solidarity with the glorious popular uprising in Syria and to condemn the brutality of the Assad regime against unarmed protesters." They took issue with the regime's "labeling of demonstrators as foreign lackeys." In response to a call by the militant Hizb al-Tahrir al-Islami (Islamic Liberation Party) for a pro-rebel demonstration in downtown Beirut, Lebanon's Arab Youth Party (a Syrian intelligence creation with no active membership) organized a counter rally in support of Assad. Party head Nadim Shimali condemned the anti-Assad rally as a violation of the 1989 Ta'if agreement, which stipulated that Lebanon would not allow itself to provide a base for any force, state, or organization seeking to undermine Syria's security. He urged the Lebanese authorities to crack down on anti-Syrian activities, threatening that otherwise his party would be forced to take matters into its own hands. "The security forces complied with Shimali's warning and ensured that no activity would take place in Beirut or Tripoli to support the Syrian protest movement," lamented a communiqué issued by Hizb al-Tahrir. "They threatened to prevent any show of support outside mosques. In contrast, the [Lebanese] authorities allowed a handful of the Syrian regime's gangsters to demonstrate." However, this complaint was not entirely true. The government tried to strike a middle-of-the-road approach to the Lebanese divide vis-à-vis the Syrian upheavals. Lebanon's open political system did not interfere with the free expression of opinion on the Syrian situation. The Phalange Party, for example, announced that its branches in northern Lebanon were providing humanitarian and social aid "to Syrian families seeking refuge there." The Future Trend party and Islamist groups threw themselves into providing humanitarian aid to several thousand Syrian refugees despite protests by the Syrian government and Hezbollah on the grounds that the refugees included subversive elements. The Lebanese military simply pulled out from the border area and allowed the Syrian army to chase defectors while, at the same time, it did not attempt to prevent sympathetic Lebanese groups from providing them with shelter. The Beirut government did all within its power to minimize the damage to its relations with Damascus as a result of the strong support among most Lebanese for the Syrian uprising. Foreign Minister Adnan Mansur made it clear that Beirut would not vote in favor of a Security Council resolution condemning Damascus. This position was hardly defensible or consistent given that Lebanon's ambassador to the U.N. had proposed that the Security Council implement a no-fly zone over Libya to protect its people from the excesses of the Qaddafi regime. The spread of protests inside Syria coincided with the deterioration of the security situation in Lebanon, including several attacks against the U.N. Interim Force in Lebanon (UNIFIL) in the south of the country. According to Fares Said, coordinator of the secretariat of the March 14 coalition, the surge of violence in Lebanon appears to be tied to statements from Damascus. Said was specifically alluding to the attacks on the French and Italian contingents in UNIFIL, the abduction of seven Estonians in the Bekaa Valley, and the Marun al-Ras incident where the Israelis opened fire on demonstrators who attempted to climb the border fence. Indeed, Assad's cousin Rami Makhluf had warned that Israelis could not expect to live in peace while Syrians suffered from turmoil whereas Syrian foreign minister Walid Muallem threatened that EU sanctions against Damascus were bound to have an adverse impact on Europe's security. Small wonder that the Assad regime exhibited anger at expressions of solidarity with the protesters, especially by the Lebanese armed forces and the Phalange. Phalange MP Nadim Jemayyil made a statement that particularly infuriated the Syrian regime: "We cannot but side with the Syrian people in their confrontation of the repressive and dictatorial regime. We are willing to open a new chapter with the Syrian people and join hands to build a new Middle East founded on freedom and democracy." Assad's people expected nothing less than such statements as Hezbollah MP Hassan Fadlallah asserted that Washington was punishing Damascus by promoting the Syrian protest movement "in order to settle historical scores with the country that has always stood on the side of the forces of opposition to Israeli and American occupation." President Assad seemed in no mood for advice, certainly not from mercurial Druze chief Jumblatt who exhorted him "to think differently and recognize his people's legitimate demands in order to prevent Syria from slipping into chaos." Speaking carefully to avoid triggering a defensive reaction, Jumblatt explained that "the best advice he could give to the Syrian president had to be motivated by truthfulness, and not flattery." When the Druze leader would not cease his repeated calls on Assad to reform, the Syrian authorities finally informed him that he was unwelcome in Damascus. For Assad, his late father's brutally repressive practices of the 1970s and 1980s appeared fully appropriate in the second decade of the twenty-first century. He may have believed that his Tunisian and Egyptian counterparts fell too soon because they did not use sufficient force to suppress the opposition. Among his many repressive measures, Assad instructed his Beirut ambassador Ali Abdulkarim to chase and apprehend Syrian enemies of the regime in Lebanon. Indeed, Abdulkarim was singled out for U.S. and EU sanctions for his role in abducting opposition members in collusion with Lebanese authorities. The Lebanese government clamped down on Syrian opposition in Lebanon because of heavy pressure by the Assad regime to do so. Yet it showed leniency in dealing with the anti-Assad Lebanese protesters. Members of the Syrian opposition in Lebanon are not part of the country's political process and can be readily controlled. Dealing with the Lebanese groups and sects, by contrast, is a different matter altogether as they have a veto power and can bring the country's political system to a standstill. Lebanon is not a failed state. Though its self-steering capability is grossly wanting, it is perfectly capable of making waves. Its political system may be akin to a person paralyzed below the waist but with functioning arms and intact vocal abilities. The creation of Greater Lebanon may not have been an entirely happy historical accident, yet it appears to be quite capable of dealing with its disabilities. It cannot make its own sovereign decisions, but it can almost always modify them to fit the exigencies of its unique political formula. For some countries, controversy can be politically debilitating; in Lebanon, it is a means of survival. Al-Liwa (Beirut), Mar. 14, 2011. As-Safir (Beirut), Sept. 3, 2011. "No One Likes Them," Now Lebanon (Beirut), Sept. 15, 2011. Al-Hayat (London), Mar. 28, 2011. Lebanese Broadcasting Corporation (Beirut), Feb. 9, 2010. Al-Manar TV (Beirut), Mar. 21, 2011. Al-Jarida (Beirut), Mar. 6, 2011. BBC World News, July 3, 2011. As-Siyasa (Kuwait), Sept. 6, 2011. The Daily Star (Beirut), Sept. 12, 2011. Ukaz (Riyadh), Sept. 7, 2011. Ar-Rai (Kuwait), Oct. 4, 2011. Al-Akhbar (Cairo), May 9, 2011. Committed to the reintroduction of the worldwide caliphate, this party rejects the existing order in all Arab and Islamic states and advocates its violent overthrow. The Daily Star, June 4, 2011. Ibid. ; al-Akhbar, Apr. 11, 2011. Al-Anba (Fallujah), Sept. 24, 2011. Related Topics: Lebanon | Hilal Khashan | Winter 2012 MEQ receive the latest by email: subscribe to the free mef mailing list This text may be reposted or forwarded so long as it is presented as an integral whole with complete and accurate information provided about its author, date, place of publication, and original URL.